LAKE SUCCESS, N.Y.--(BUSINESS WIRE)--Feb. 17, 2005--For photographers whose idea of a close-up is the full-frame flutter of a bumblebee's wings, Canon's new EF-S 60mm f/2.8 Macro USM lens makes it happen. And...for photographers who do not want to bump the bee's knees, spook the subject or receive a stinging rebuke (or worse), Canon's new infrared Wireless Controller LC-5 can make compelling close-ups a snap, even from more than one football field away. Both products will be on display at PMA 2005, February 20 - 23 (Canon Booth #3503), in Orlando, Fla. The EF-S 60mm f/2.8 Macro USM lens is a compact, internal focusing lens designed specifically for the just announced EOS Digital Rebel(R) XT SLR camera as well as the prosumer EOS 20D and entry-level EOS Digital Rebel SLR cameras. The new lens focuses from infinity down to 1:1 (lifesize) at a generous working distance of approximately four inches from the subject. What's more, because it is an internal focusing lens, the physical size of the new lens remains constant, ensuring that it will never inadvertently invade a subject's space. This is a particular advantage in macro nature shooting with live subjects when sudden lens movement such as a forward focus adjustment with a conventional macro can cast an unwanted shadow on the subject or send more wary species scampering for cover. Optimized for the large, APS-C size CMOS imaging sensor used by the two Digital Rebel cameras and the EOS 20D SLR, the EF-S 60mm f/2.8 Macro USM lens takes full advantage of the short back-focus and small image circle that characterize EF-S type lenses. The lens uses a 3-group floating inner focus system in which group one is fixed while groups two and three move on their own separate tracks. The process provides enhanced correction for any aberrations that may arise during focusing as well as a "flat field" that optimizes the lens' center-to-corner performance with tack-sharp image quality over the entire shooting area. This is coupled with a working distance of 90mm from the front of the lens to the subject during 1:1 macro photography, the longest working distance in its class. Though it is a true macro lens in all respects (as opposed to a zoom lens with a macro setting), the 1.6x focal length conversion factor (created by the difference in size between the cameras' image sensor and a traditional 35mm film frame) gives this 60mm lens an angle of view equivalent to a 96mm lens on a 35mm camera, making it a high-end performer as a portrait lens as well. While the lens features Canon's rugged metallic EF bayonet mount, the back of the lens is designed to prevent it from being mounted on cameras that do not accept EF-S lenses, and features a rubber ring to prevent damage to the camera. The mount also serves as the conduit for signal transmission between the lens and the camera, providing such EOS dedicated information as lens status, lens type, metering information, focal length, distance information and AF drive information. Finally, the EF-S 60mm f/2.8 Macro USM lens is constructed of environmentally friendly lead-free glass, and it is treated with Canon's Super Spectra coating to help ensure exceptionally accurate color balance while minimizing flare and ghosting. Employing Canon's quieter and faster Ring USM (ultrasonic motor) autofocus drive, a high speed CPU and an improved AF algorithm for fast autofocusing, the EF-S 60mm f/2.8 Macro USM lens also accommodates manual focusing even when the camera is in the AF mode. The lens is also compatible with Canon's specialty macro Speedlites, the Macro Ring Lite MR-14EX and Macro Twin Lite MT-24EX. Working in Macro mode can demand a level of precision and steadiness that goes beyond the tolerances of typical picture taking. Mounting the camera on a sturdy tripod and controlling the camera functions with a remote switch are long-standing methods of minimizing camera shake and vibration. Now, thanks to Canon's new Wireless Controller LC-5, photographers can easily create compelling close-ups from a safe and secure "line-of-sight" distance of up to 330 feet. Far more than a wireless shutter release, this newly enhanced infrared remote provides photographers with the flexibility to control essential camera functions without intruding on the scene. The Canon Wireless Controller LC-5 simply attaches to a compatible camera's accessory shoe or can be separately attached to a supplied bracket and connected to the camera's three-pronged N3 Remote socket with the supplied 15-inch receiver cable. The unit is triggered with a pocket-sized transmitter that sends an infrared pulse-modulated strobe signal to the receiver. Powered by 4 AA alkaline batteries (approximately 4,500 operations per set), the LC-5 controller is also compatible with AA-size Lithium, oxyride and Nickel-hydride rechargeable batteries. Offering photographers the situational adaptability of four control modes, the LC-5 can be set to Single-Shot mode which captures one shot each time the transmitter button is pressed; Continuous mode which signals the receiver to keep firing the camera (until the transmitter button is pressed again or until the camera's buffer memory limit or maximum storage card capacity is reached); Test mode which illuminates a red LED on the receiver to confirm that the unit is operating properly before shooting, and Delay mode which fires a single shot approximately 3.5 seconds after the transmitter button is pressed. The Wireless Controller LC-5 is also equipped with three channel settings (A, B and C) to ensure that multiple remote Canon users do not inadvertently set off someone else's camera or in situations where a single photographer is remotely triggering more than one camera setup. In that instance the photographer has the option of firing the separate cameras individually and at will or all at once by selecting the unit's "ALL" setting. Whether capturing nature shots in macro mode or intimate wildlife studies that must be fired at a distance, Canon's Wireless Controller LC-5 expands the ease and with it, the opportunities for unmanned but not unmonitored photography. Among the expanded capabilities offered by the LC-5 that were unavailable on the predecessor models is the improved one-shot release mode (1SR) that permits the photographer to pre-focus the camera and then essentially lay in wait - virtually indefinitely - for the subject to cross into range. By pressing the LC-5 transmitter trigger fully, the LC-5 remote receiver can now "wake" the camera from its energy saving "sleep mode" and capture at will the image that the photographer has patiently been waiting for. In other than 1SR mode, the photographer need only depress the remote transmitter's trigger button halfway to engage the camera's autofocus before shooting. The Wireless Controller LC-5's components - transmitter, receiver and bracket - pack up into three conveniently-sized cases for increased ease of use. The unit is compatible with Canon's prosumer EOS 20D digital SLR (and its predecessor the EOS 10D) as well as the professional digital SLR cameras including the EOS-1D, EOS-1Ds, EOS-1D Mark II and EOS-1Ds Mark II. Not limited to use on digital models, the Wireless Controller LC-5 is also compatible with several EOS 35mm film-based SLR models including the EOS-3 and the EOS-1v. Though using the Wireless Controller LC-5 and the EF-S 60mm f/2.8 Macro USM lens together is only possible on the Canon EOS 20D camera (as it is currently the only camera that accepts both the EF-S type lens and has the three-pin N3 remote socket), two other remote switches - the wireless RC-1 and the wired RS-60E3 - are compatible with both the EOS Digital Rebel and EOS Rebel XT digital models. 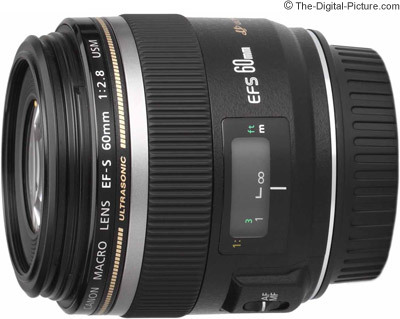 The EF-S 60mm f/2.8 Macro USM lens is of course compatible with all three digital SLRs. The RC-1 is a miniature infrared transmitter with a range of up to 16.4 feet. It may be set for either instant shutter release or 2-second delay. The RC-1 may also be used to activate mirror-lock and bulb-shutter functions. The RS-60E3 wired remote switch features a two-foot cable and replicates all of the functions of the EOS Digital Rebel and EOS Digital Rebel XT cameras' shutter-release button. * Pricing is subject to change without notice at any time. All prices are set by the individual dealer and may vary.